Al Circle reported that the dichotomy of alumina and aluminium remains on the same page as alumina is falling on the price curve while primary aluminium is recovering from the recent fall that started in November. 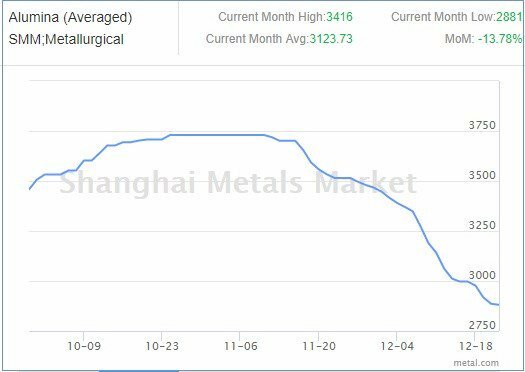 Spot alumina price in China has dropped from the year’s high of RMB 3730 per tonne in November first week to RMB 2881 per tonne today. Domestic alumina prices have also slipped to RMB 2850 per tonne today. Aluminium price rise has been slow due to falling prices of alumina. The contract rose overnight yesterday December 20 on news of potentially lower alumina output due to natural gas shortage. SMM however observes that alumina production would not be impacted much as most producers use coal gas as fuel. Another factor that is keeping alumina prices low is its high inventory driven by slow demand from smelters.